Mike Fish marked his debut with both goals as Brighouse Town notched a 2-1 home win over Prescot Cables in the Evo-Stik NPL’s First Division North yesterday. 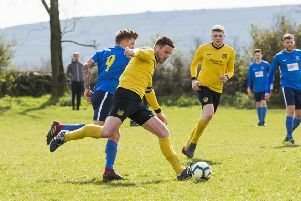 The ex-Mossley player struck twice in eight minutes towards the end of the contest as Brighouse ended a four-game run without a win. Cables are third from bottom but they held out until after the dismissal of Valter Fernanadez in the 62nd minute. Fish, a prolific scorer throughout his career, headed the opener from a corner on 74 minutes and then made an interception deep in Cables territory and curled home his second. Dominic Reid pulled one back with four minutes left to ensure Brighouse were kept up to their work to the final whistle. Fish later took to Twitter to express his satisfaction at his afternoon’s work. “Glad to have scored two on my debut for Brighouse Town and get a well deserved win,” he said. Brighouse, who are eighth in the table, are at home again on Monday. They host Ossett Town and it promises to be a tough game with the visitors in second place and 3-0 winners at Clitheroe yesterday.